Number portability between operators in Sweden is handled by the company SNPAC. SNPAC provides either a web interface or a so-called direct connection for the possibility of integrating the operator’s own business against them. Direct connection is both expensive and complicated to implement against, therefore we offer a simplified interface to a lower cost. NP is both a web interface and a SOAP API (web services) where all handling of a porting can take place, such as request for porting, responding to out portings, change of porting in progress, cancellation, reference data change, etc. 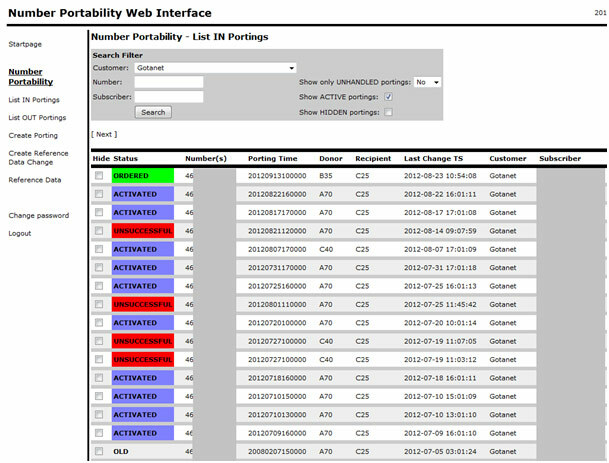 The default interface offered by SNPAC to manage portings requires a lot of manual input. Every incoming event requires attention. Leissner Number Portability automatically handles standard events and can inform certain staff regarding unhandled portings and also automatically accept out-portings after a certain time. Leissner Number Portability offers an easy yet powerful SOAP API to handle in- and out-portings as well as reference data lookups. Integrate NP directly into you company’s CRM system or design your own system to manage portings, leaving all of the complex communications to us. Number Portability relies on the reference data of both number series (PTS) and porting history (SNPAC). Utilizing either the web interface or SOAP interface it is possible to lookup the current owner of a number as well as its history.